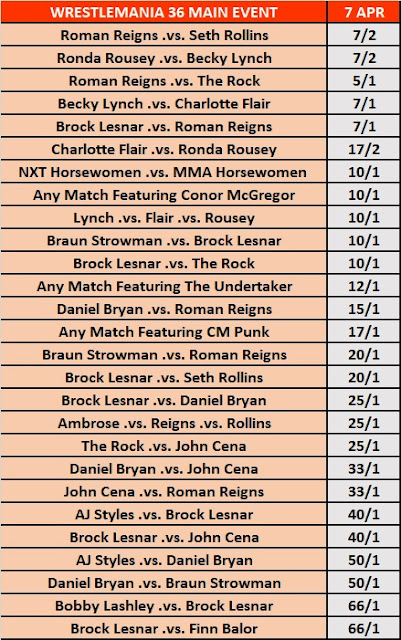 I'm going to write a lot more about WrestleMania 35 wagering over the next few days, but - first - I would like to cover something that I put off doing last night as I didn't have enough time to get to it. Early yesterday evening, I pointed out that Kambi had installed a market in which customers could place wagers on what the 'Lasting Image' will be of WrestleMania 36. 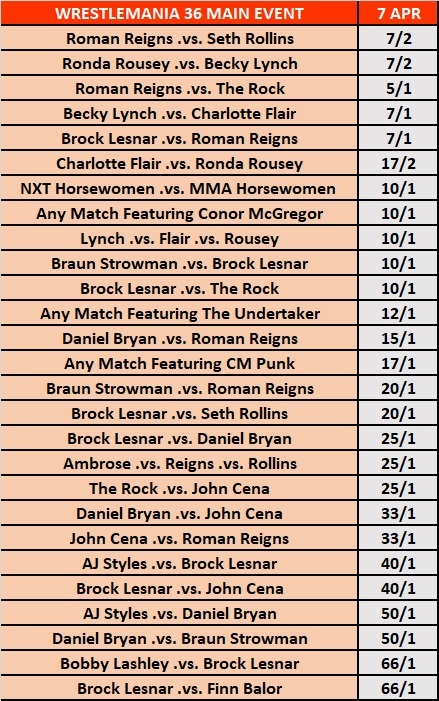 The market wasn't the only Mania 36 special to be priced up ahead of Mania 35. Later that night, the bookies priced up a special in which the customers can wager on the main event of next year's show. Two matches opened as 7/2 joint-favourites. They are Roman Reigns .vs. Seth Rollins and Ronda Rousey .vs. Becky Lynch. Bearing in mind this market was priced up before last night's main event result, I think it was a fairly good call to see Rousey versus Lynch as one of the favourites. In one of the recent issues of the Wrestling Observer Newsletter, Dave Meltzer had written the plan for yesterday's match was to clearly set up something for next year's Mania. I assumed it could have either been something like the Horsewomen .vs. Horsewomen (I didn't think it would main event, but Kambi had it at 10/1 yesterday) or Lynch versus Flair (7/1). If the finish was still meant to hint at a match for next year's show, then the assumption would be Rousey .vs. Lynch. I thought the singles match would have happened before next year when I saw the market yesterday. I also get the feeling that next year's event will be back to having male participants in the final bout of the night. On top of that, I think it's safe to guess that Roman Reigns will be one of the main eventers. Kambi did the same sort of market for this year's show and published on the night of WrestleMania 34. I had a look back at the post in which I first wrote about it. I found it funny to see how Rousey .vs. Asuka opened as a favourite but - following Charlotte Flair's win over the 2018 Women's Royal Rumble winner - Rousey .vs. Flair became the fave. I get the feeling the result from last night's show might move Rousey .vs. Lynch as a sole favourite. It'll be something to look out for once it's republished. Never say never with WWE , but I agree it will likely be a Male main event next year. Probably. Maybe. No doubt Reigns is going to be top boy again this time next year, so it's hard to bet against him right now. Whether itll be against Seth is another question. Trying to think of who else could win the royal rumble..